Featured here is a collaboration between Alicia Hilton, Suzy Erin, and Ben Grigg. Alicia is an author, a law professor, and a former FBI Special Agent. For more information about her poetry and other publications, visit www.aliciahilton.com. Ben and Suzy live in Chicago. They comprise the band, Deathsnack. For this piece, Ben and Suzy wrote and recorded a song for Alicia’s poem. 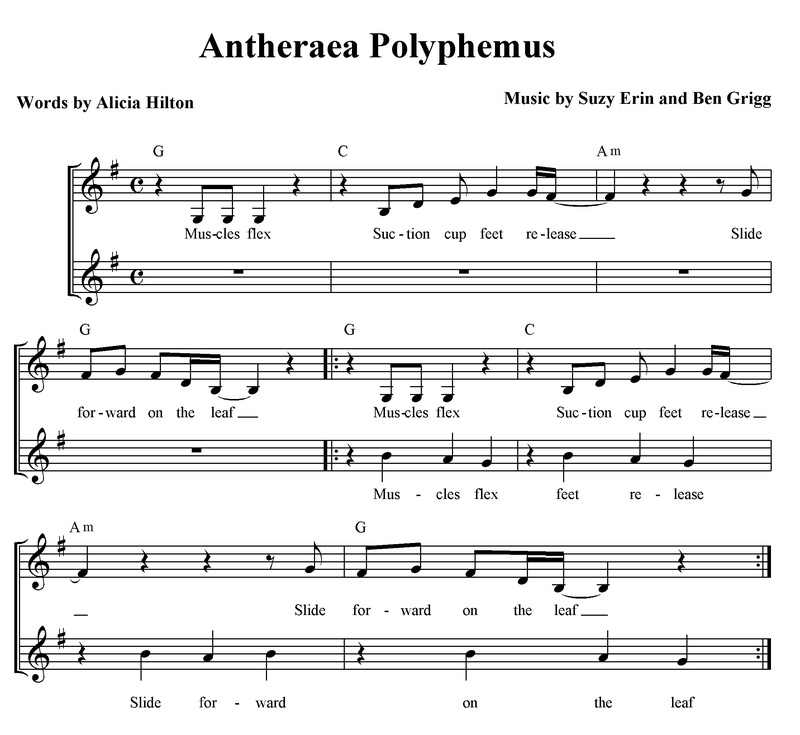 Download Antheraea Polyphemus or click below to listen. Oh my gosh, yesterday I found an antheraea polyphemus, I had never seen such a huge florescent green bug in my entire life, the creature was struggling to creep across my long brick patio, so I looked around got a leaf big enough to pick him up and take him over to my hosta plants. That night i did some research to find he was this antheraea polyphemus. I tried my best not to keep checking on him. I was so very saddened the next morning when i found that the leaf was blown over to the stone wall with a 20 foot cliff and I did not see the creature. But later today i checked again and he was in there spinning silk. So not wanting to disturb him, but worried about the drop he might not survive, I once again gently picked up the leaf and moved him under the hosta plants. Well then a later today a huge storm with high winds and downpouring rains came through so before it was crazy out there, I once again picked up the leaf, put him and his leaf in a bucket and moved him to my garage for safety. So thrilled to have him alive, I once again was searching the internet to make sure I do right by the little fat creature, when I came upon your song and oh my gosh I JUST LOVE THIS SONG!! The words totally describe him and how i found him, and the music is delightful and perfectly suited to his gait. Thank you for such a sweet whimsical song! I would love to put this song to my photos of him and maybe post it on face book, would that be ok? If not that is fine, but I wanted to tell you that this song is just perfect!!! Wendy, I’m sure that Ben, Suzy, and Alicia would love it if you shared their song. I’ll let them know that you’re enjoying it. I really like your story and I’m glad you rescued the little guy from harm. Thank you for liking the song! Ben and I would be happy for you to do whatever you like with it. If you make something with your photos, we’d love to see it.